Like my first attempt at a stout (which was nowhere near an Imperial, but still), the base of this beer is all light DME, so I'm getting all the color and flavor out of specialty malts, of which there are a lot. Indeed, this is the most malt I've used in a recipe since my second batch (a Belgian tripel), and this is a great deal more complex too. 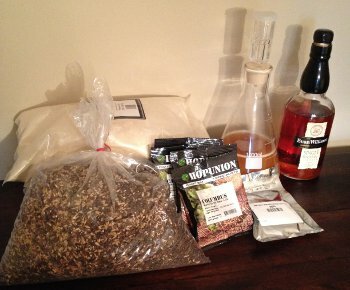 (I originally only planned on a half pound of Debittered Black Malt, but my homebrew shop was only selling it in increments of 1 pound, so I figured why not). Steeping the grains in 2.5 gallons of water (needed to add more because I was using so much grain), the wort got super black, almost like black ink, and smelled strongly of coffee. According to my calculations, this should come out at around 59 SRM (anything over 30 is generally considered "black", and my previous attempt at a stout was around 45 SRM). Once I steeped and sparged the grains, I added 2/3 of the DME, adding the last 1/3 halfway through the boil. I actually had a bit of a boil-over mishap. Perhaps I started with too much water, which raised the level of the wort higher than normal (for me, at least). And it turns out that 9 pounds of DME takes up a lot of space too. In any case, I didn't lose too much liquid and the crisis was mostly averted, so all was well there (it just made for more cleanup, boo). Aside from the amount and variety of malt, the other big change from my first stout recipe is a more well rounded hop schedule. I felt my last batch didn't have enough bitterness, and since this sucker is much bigger, I went with a high alpha hop in Columbus, and straightforward Cascade for flavor and aroma (not that those characteristics should or would be dominated by hops, but the Cascade should add some complexity, which is what I'm going for here). Original Gravity: 1.098 (around 23.1°Bx). This is exactly on target, so I must have done something right! If all goes well, the ABV should wind up somewhere just north of 10% ABV, with enough residual sugar to stand up to the Bourbon and oak (FG should be somewhere around 1.023, assuming 75% attenuation). Speaking of which, I used a Yeast starter for this batch. 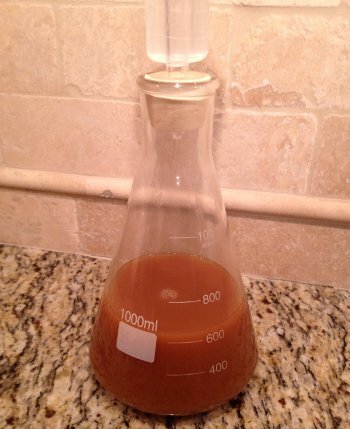 Yeast starters are not always necessary, but they seem to be a general best practice. All you do is pitch your yeast into a small amount of wort, which gets the yeast working and increases cell population dramatically, then you pitch the result into your full batch. For a beer this size, pitching more yeast is usually recommended, and will lead to a faster fermentation with less of a chance for off flavors or infection. This is my first attempt, and it seemed to go ok. Near as I can tell, I made a relatively small starter, and some recommend making a larger one, but I didn't really have time to keep stepping it up (I started it on Thursday night, and it was ready to go on Saturday). That being said, I'm guessing I significantly increased the amount of yeast I pitched, which is certainly better than just chucking one yeast packet in the wort (or paying another 6 bucks for a second packet). Update: Fermentation is going strong. Since I was using a yeast starter, I began fermentation with a blowoff tube (instead of your typical airlock) and I'm glad I did. Within 24 hours, this sucker is fermenting like crazy. All was fine a couple hours ago, then I went out for dinner and boom, blowoff tube engaged fully. 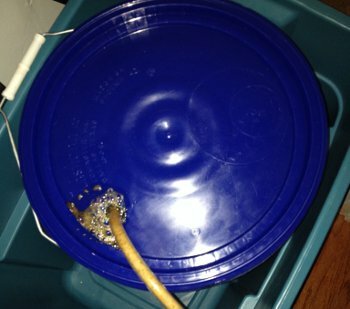 Otherwise, this thing might have popped the lid on my bucket, shooting yeast and partially fermented wort everywhere. Ha.